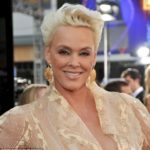 Brigitte Nielsen is a Danish-Italian actress, model, singer and reality television personality who began her career modelling for Greg Gorman and Helmut Newton and several years later acted in the 1985 films Red Sonja and Rocky IV. She is also known for her marriage to Sylvester Stallone, with whom she starred in the 1986 film Cobra. She played Karla Fry in Beverly Hills Cop II (1987), co-starring Eddie Murphy, and played the Black Witch in the Italian film series Fantaghiro between 1992–96. "All I know is it destroyed my family, it destroyed my marriage to Sylvester and I will never get over it." "I’ve covered a lot of ground geographically and emotionally and for years I lost my connection with my family. But the best comfort you can have, whether you are on the phone or sitting there in the living room with them, is with your parents, and to me family has always meant protection. When you smile you get a smile back, unconditionally."